CLARKSBURG, W.VA. – In its December 30, 2014 issue, The Exponent-Telegram editorial board named the Marcellus Shale industry as the Success Story of the Year. To whom? Maybe to the industry, but not to the people of Lochgelly, W.Va., who have been living in a community ravaged by dumping of drilling waste that has poisoned their water to the extent that this community has the highest rate of leukemia in the state. And they are not alone. The Pennsylvania Department of Environmental Protection has produced a report that shows water contamination confirmed in over 243 cases by gas drilling activity and waste. 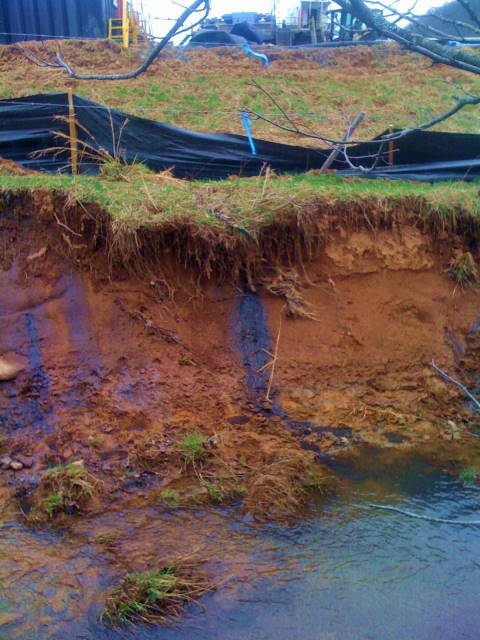 Polluted water at a fracking site in Harrison County, where Clarksburg is the county seat. Photo by Ed Wade Jr. Here is a link to a very informative short film: http://vimeo.com/105513941 It may shock you or upset you to know that this is going on here in West Virginia, a headwaters state. Our water feeds a large portion of the country, and we are too shortsighted to protect it. Weak, unenforced laws, inadequate numbers of inspectors, and lack of oversight have allowed the Marcellus Shale drilling industry to poison us. State and local officials seem to turn a blind eye to the suffering of their poorer constituents, while those that stand to gain financially are protected and kept unaccountable. The Marcellus Shale boom has been very good to a few people – industry reps and CEOs for certain, and the few thousand that have gained employment in this dirty industry (most of them moving in from out of state, uninformed of the dangers to their own health and safety from working in the industry). But to the people whose water has been and will be poisoned for good, and for the people who have been made sick by the components in the drilling waste, this is not the definition of success. This article adds insult to injury by declaring shale gas as “a key part of energy independence,” adding that, “From a footprint standpoint and from an environmental standpoint, this is far less obtrusive,” and claiming that “natural gas extraction has become a ‘very highly efficient’ industry.” Since when are using and poisoning millions of gallons of fresh water, destroying a water supply and sickening the people, viewed as “efficient”? If an editorial board ever deserved to be ashamed, this is it. We in West Virginia are viewed as backward. Is it any wonder why? While the rest of the world pushes toward sustainable energy, we rush backward to the very fuel source that has been proven time and again to wreck our hopes for a sustainable future. I hope that we will soon find that our problems are not insurmountable, but they are deeply ingrained in our culture. Coming from a culture of poverty, we have not yet learned to be forward thinking, but we must learn it quickly. If we don’t change direction now, our future will be a very bleak one indeed. © April Keating, 2015. April Keating writes from her home in Upshur County, W.Va.
Yeah, benzene in the drinking water, that’s a great success story. I think you got it right April. Are you familiar with the Coalition to preserve the Democratic Party in WV? They have a group on FB and also meet regularly in Charleston. Let me know if you’re interested in following their activity, there is some good discussion going on in that group. Indeed. NY state has banned fracking. There were two fracking incidents that evacuated at least 20 families from their homes the week before Christmas, one in Monroe County OH the other in Washington County PA. When will we learn? Our Current Energy Policies, using Toxic Coal, Poisoning Fracked Natural Gas an Deadlt Radiated Fuel Rods, are Destroying Our Fragile Eco-Systems an Warming Our Planet. Clearly this woman has no children that she cares about….or maybe all her drinking water is bottled.